My relationship with Lone Wolf began exactly three years ago when I moved to the Bed-Stuy side of Broadway, dangerously close to the bar. During the first week, I flirted with the idea of paying a visit to the dark dive on the corner but chickened out every time I was about to cross the street. As a proud introvert, I try to avoid throwing myself into new places packed with strangers. After a particularly crappy day at work in April 2015, I took the plunge. I walked into a dimly-lit establishment that greeted me with the familiar dive-bar fragrance of stale beer, stagnant cigarette smoke, and…hot dogs? I climbed onto the only empty stool at the bar, clearly a first-timer who stuck out like a sore thumb in a sea of leather jackets, sewn-on patches, and worn-in denim. That night I met Pirate Mike, my first Lone Wolf bartender and a Lower East Side legend. When he learned that I was new to the neighborhood, he poured me a beer and shot on the house and engaged in a conversation for the rest of the night (while somehow fetching drinks for dozens of other patrons). As far as first impressions went, I knew I was going to come back. The next three years were a whirlwind. Lone Wolf was where I learned to shoot pool (thanks, Long! ), met my ride-or-die best friend, began my unwavering romance with Bud Heavy, amassed a group of close friends I now consider family, witnessed one too many fights, danced and sang my heart out, drank too much, laughed too hard, and — perhaps most importantly — met the love of my life. It’s where I celebrated major holidays — July 4th, Thanksgiving, Christmas, Super Bowl, and most birthdays — and where I brought all my new boyfriends to “meet the family.” Every Lone Wolf outing could usually be recapped with a story so ridiculous, you just had to be there to understand. It wasn’t all happy memories all the time. In 2016, rumors of a potential shut down suddenly began circulating. Then-owner Jessica Lee Wertz had closed down Black Bear and No Name, Lone Wolf's sister bars, and was attempting to find a new owner for all three. On a Saturday night in late October 2016 the doors of "the old Lone Wolf" closed for good. 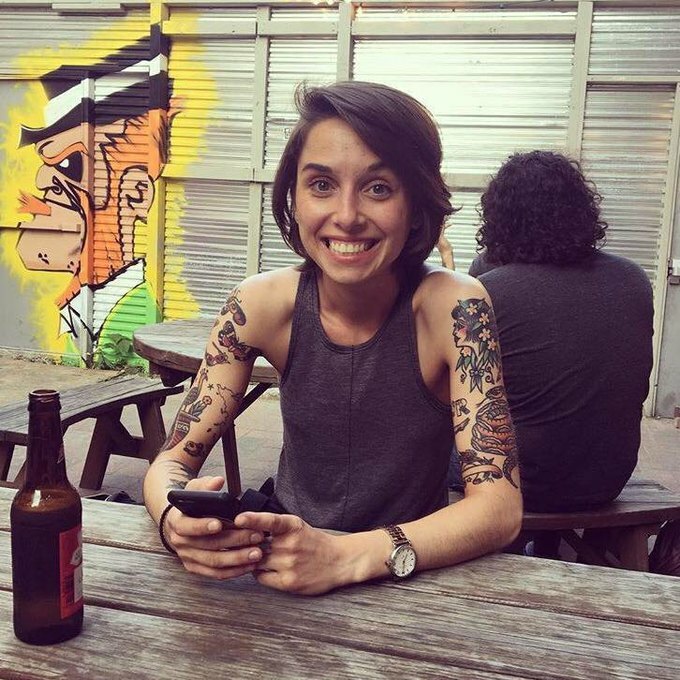 For the next few months, the destiny of the beloved Bushwick bar was uncertain. Sometimes I'd see interested buyers entering the bar for a quick tour, but no deal was struck. 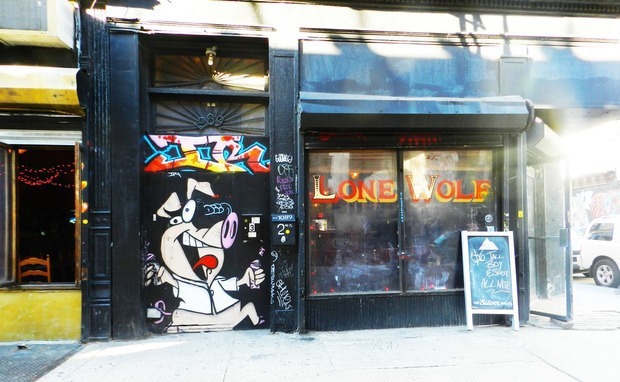 It wasn't until mid-January 2017 when Lone Wolf suddenly reopened its doors under the management of John Cutillo, known for his Lower Manhattan landmark bars: Iggy's, Local 138, and the Spotted Owl. "The new Lone Wolf" got a facelift. The bar was notably missing its photo booth that always reeked of stale urine but documented the wildest late-night moments. New high-top tables lined the wall, providing additional seating. Wolf-centric art covered the walls. The sneaky podium that was easy to trip over at the door had been demolished. That’s to say nothing of the evolution of the culture and overall feel of the bar: Prices have gone up, bartenders have come and gone, and a frozen-drinks machine even made a brief appearance. While the weekly roster of regulars has mostly remained the same, the weekend clientele over the years has become diluted with newer customers that are just dipping their toes into the Bushwick nightlife. These new faces are welcomed with open arms as long as they don’t put their names up on the board for a game of pool — most of the arguments and fights I’ve witnessed have happened around the green-felted table. Next time you find yourself under the rattling, elevated JMZ train tracks and have a moment to grab a quick drink, give Lone Wolf a chance. You’re likely to encounter a deserted bar during weekday happy hours, Tinder dates in the early evenings, crowds of thirsty dudes that expect you to have a conversation on weeknights, and wild dancing parties curated by a rotating roster of DJs that never fail to entertain or disappoint after midnight.